China's first aircraft-themed test note issued__Commercial Aircraft Corporation of China, Ltd.
A photo of the front side of the first version of "C919 First Flight" test note. 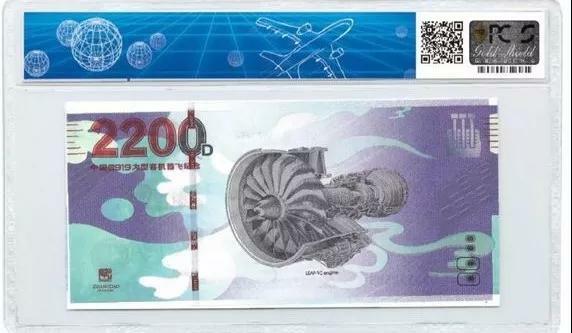 China's first aircraft-themed test note, "C919 First Flight" test note, was issued in Shanghai on February 9th, 2018. "C919 First Flight" test notes are a set of test notes specially created and issued to commemorate the first flight of C919 aircraft. The front side of the first version of the test note carries the image of C919 first flight, which shows that C919 aircraft soars up into the sky and achieves the breakthrough. 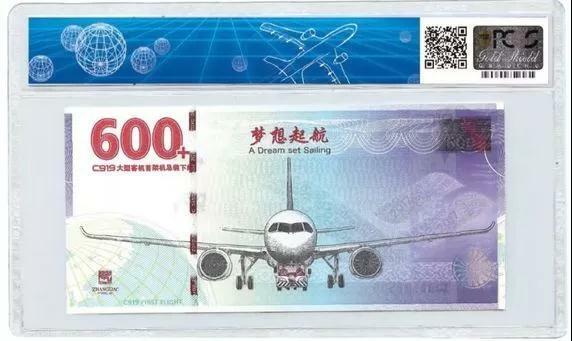 The back side is named as "A Dream set Sailing", which shows the scene that C919 aircraft is fully presented in front of the people for the first time when it rolls off, and the background watermark includes the elements such as 2017, C919 and Dream. The icon "600+" on the upper left part means that the orders of C919 aircraft have amounted to more than 600 after the first flight. The image on the front side of the second version named with "A Millennium Expectation" is created by artist Peng Mingliang, and incorporates the symbolic image of color cloud. The image of flying Apsaras conveys the millennium dream of the Chinese nation to fly in the sky. The image on the back side shows a new generation of engine used on C919 aircraft with low fuel consumption, low noise, and low emission. The icon "2200D" on the upper left part means that more than 2200 days and nights are spent by the researchers of C919 aircraft with clustered intelligence. 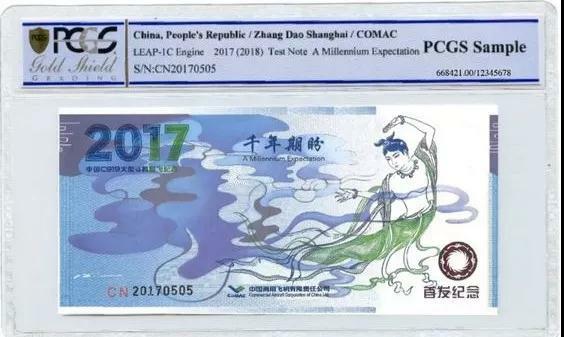 "C919 First Flight" test note has been rated by PCGS. Its successful issuance is of great significance for further promoting the culture of trunk liner, publicizing the brand of trunk liner, and enhancing the construction of corporate culture. Test notes are commemorative banknote-type vouchers issued to commemorate important events. Test notes are made based on note-printing technique, and the main picture adopts intaglio printing process; they have no face value and thus cannot be circulated, but they are a new type of vouchers with collection properties. A photo of the back side of the first version of "C919 First Flight" test note. 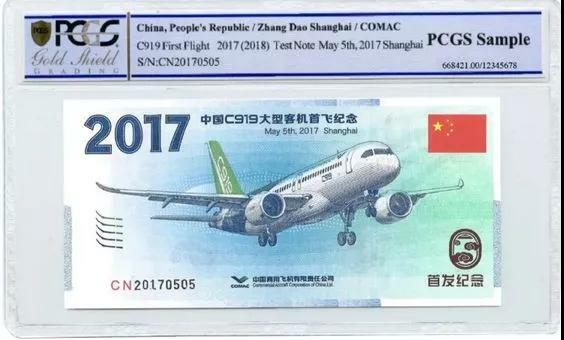 A photo of the front side of the second version of "C919 First Flight" test note. A photo of the back side of the second version of "C919 First Flight" test note.